The rest of Memorial Day was a smashing success! We bought chairs at a yard sale, set up our new hammock, tended our garden, hosted out-of-town friends for a barbecue– all on Sunday! Between running errands, prepping our house, and, most importantly, catching up with friends, B and I were flat out exhausted. 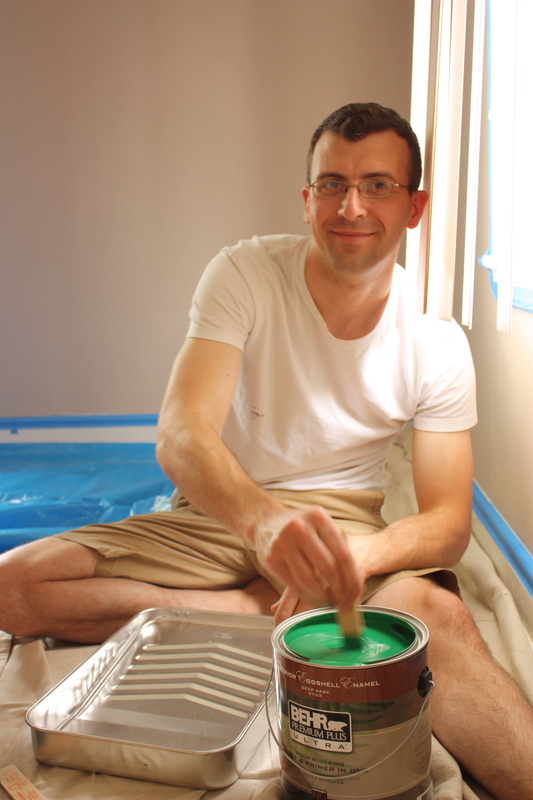 So, we decided on the only natural, therapeutic recovery for a busy weekend: painting our bedroom! 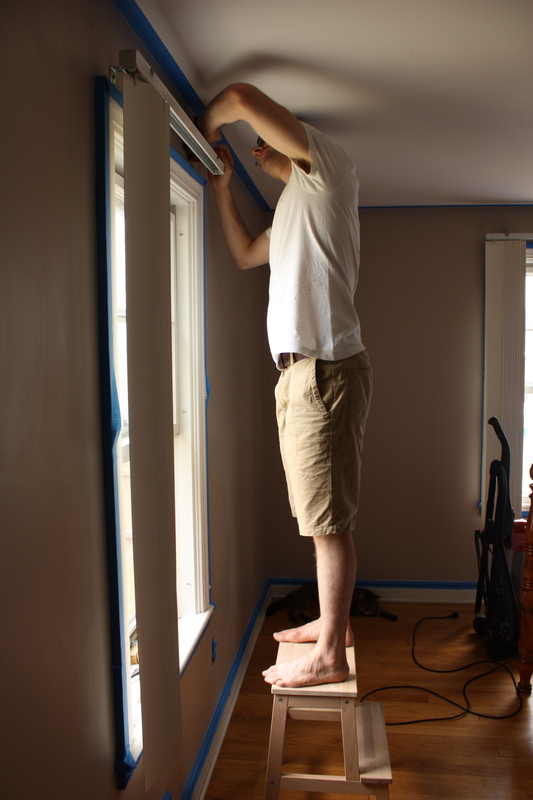 When we bought our house in December, painting the office/library and our bedroom were at the top of our list to tackle. They were easy, cost effective, aesthetic changes we could make without much recourse. Plus, most of the rooms were painted dove grey/brown which looked so dingy in certain light that it was a given that we were going to cover it up inevitably. B and I hash out plans really well, mainly because we often meet in the middle from opposite ends of the idea spectrum. I’m a bit of an Apartment Therapy addict and loved the idea of having dark walls in a small space. 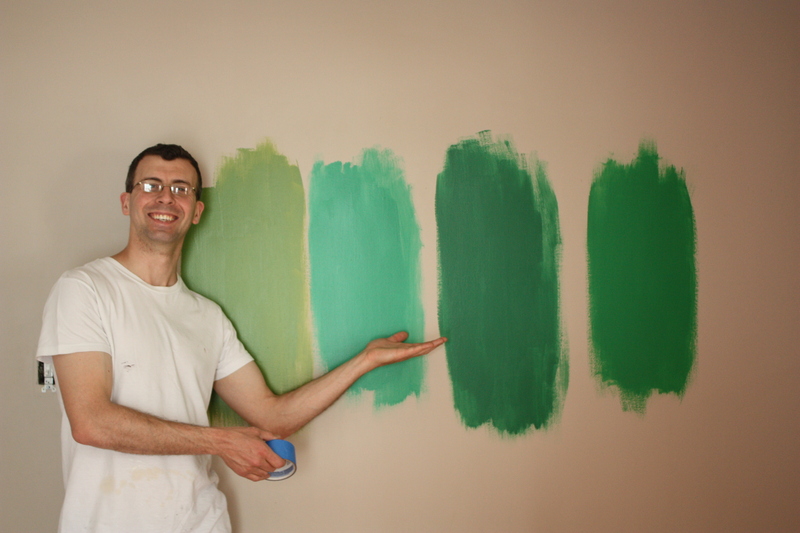 B countered that with the fact that he loves green and finds it natural, soothing and relaxing. 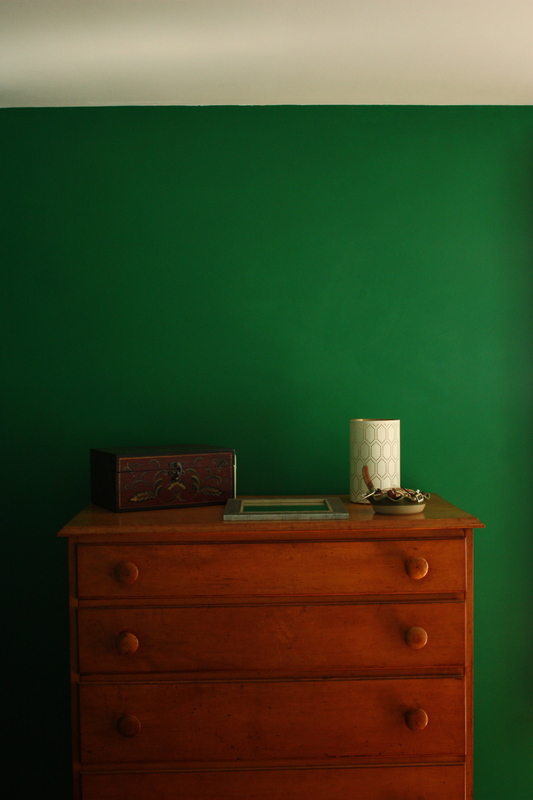 With both those ideas on the table, we settled on “the color of light filtered through forest leaves on a sunny, summer day,” or Behr’s “Pine Grove” in eggshell. 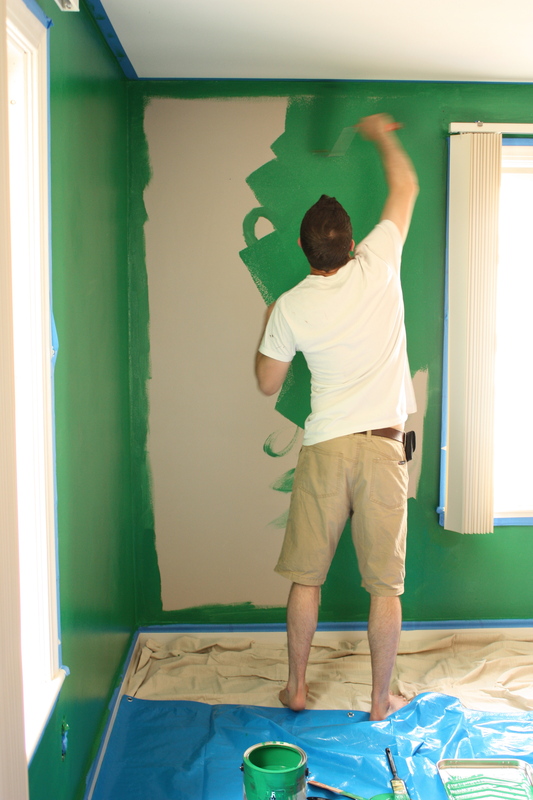 Here are some photos of the prepping process and early painting stages. Oh, and B — let me introduce the master photographer-turned-subject! 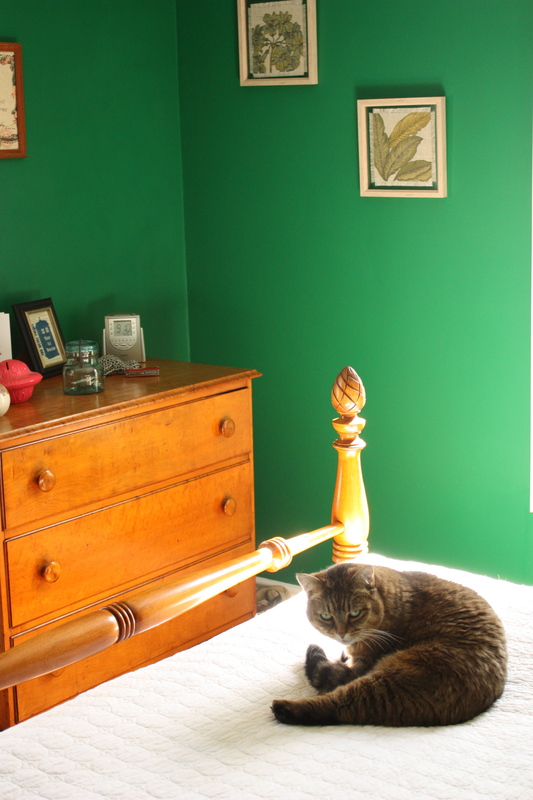 We finally finished painting late last night and moved all of our furniture back to the bedroom. 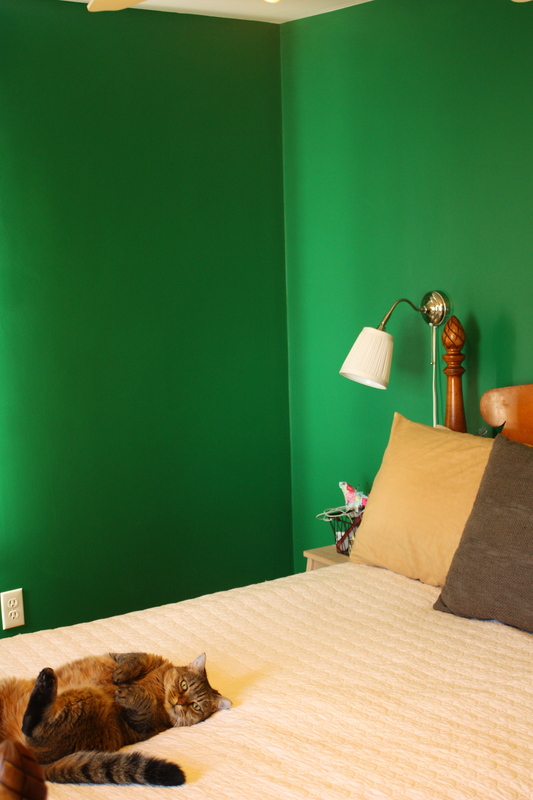 The green proved to be versatile: it was a dark, dreamy, sleepy nook in the evening, perfect for curling up after a long weekend of socializing and working. 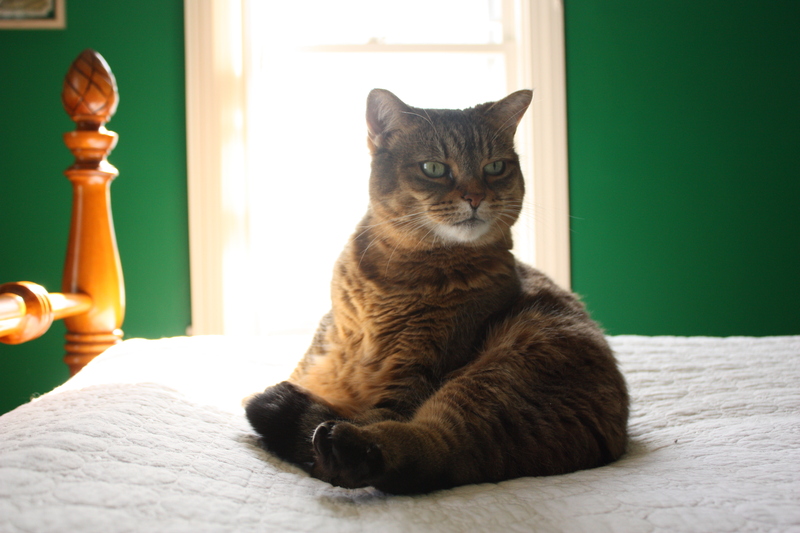 But this morning, with the bright sunshine coming through the windows, the walls glowed emerald! We obviously have some work to do. There are a couple of prints that need framing and hanging above the bed, plus a banner I’m eyeing for that empty wall by the window. As for textiles, I’d love to add long, white curtains over the boring hanging blinds and I’m thinking of a colorful throw pillow (maybe in gold or magenta!) for the bed. Like any home — new or old — nothing is ever static! More photos to come!